The Bulava (SS-NX-30) is the submarine-launched version of Russia's most advanced missile, the Topol-M (SS-27) solid fuel ICBM. The SS-NX-30 is a derivative of the SS-27, except for a slight decrease in range due to conversion of the design for submarine launch. The SS-27 ICBM is 21.9 meters long, far too large to fit in a typical submarine. The largest previously deployed Russian SLBM was the R-39 / SS-N-20 STURGEON, which was 16 meters long. Accurate tactical and technical characteristics of the "Bulava" has not been formally published. According to various media, IDB is a three-stage solid fuel rocket which can carry six to ten nuclear targeting individual blocks. Launch weight - about 36.8 t, throw-weight - 1,150 kg, length in the starting container 12.1 meters. According to the media, the maximum range is 10,000. Km. 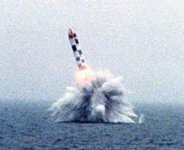 Circular error probable (the index precision shooting means the radius of the circle circumscribed around the target, which should get 50% of the warhead) missiles, according to experts, can be about 250-300 m.
Russian sources report that the Bulava SS-N-30 ballistic missile can carry ten warheads to a range of 8,000km. Other sources suggest that the Bulava might have a range of 10,000 km, and is reportedly features a 550 kT yield nuclear warhead. Apparently up to six MIRVs can be placed at the cost of offloading warhead shielding and decoys. The development of a solid-fuel ballistic missile, which was to have replaced the obsolete R-39 (RSM-52) SLBM (NATO reporting name, SS-N-20 Sturgeon), was not completed. The missile's initial three tests were conducted unsuccessfully at a White Sea testing range in the late 1990s. Each time, the missile blew up in mid-air, failing to reach its target. The R-39M SS-N-28 Bark was already in the test stage, when the Navy refused from the missile in favor of the new designer, the Moscow Teplotechnika Institute [Moscow Institute of Heat Technology]. The institute was engaged in ground based Topol missiles and actively lobbied by the Defense Minister Sergei Ivanov. Russia's Borey-class nuclear submarines will be equipped with Bulava missiles. As of 2007 three submarines were being built at the Sevmash plant in Severodvinsk in the Arkhangelsk Region, in north European Russia. Contrary to some expectations, by 2007 it was increasingly clear that older Typhoon Project 941 submarines would not be expected to undergo an upgrade for the new Bulavas. 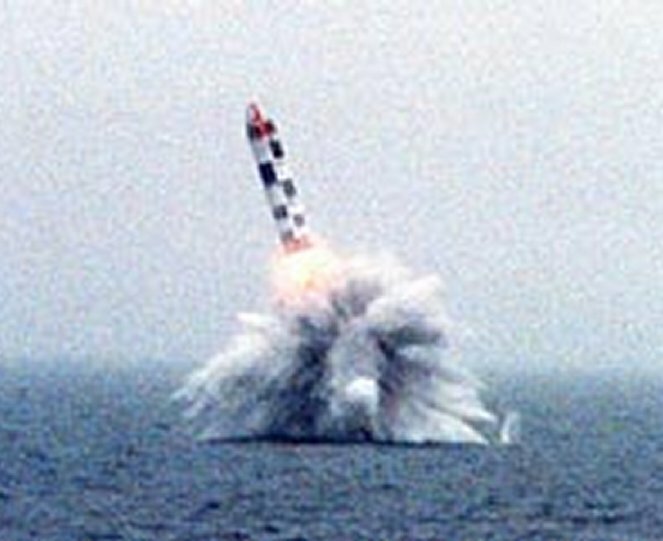 The M in the missile index stands for "morskoy," or "naval," because the Bulava is, in effect, a derivative of the land-based missile Topol (SS-27). Yuri Solomonov, head of the Moscow Institute of Thermal Technology, the Bulava designer, referring to the size and weight restrictions for sea-launched missiles, said that "here there is no talk of unification because you get two basically different theoretical approaches." Nonetheless, he admits, the designers took as much as they could from the SS-27 because in today's Russia - a far cry from the Soviet era - cost effectiveness also becomes a priority. Human resources made up for scarce financing: people who can design, test, and deploy state-of-the-art missiles appropriately for the little money they receive are certainly worth their weight in gold. The Moscow Heat Engineering Institute was ordered to develop a new SLBM, i.e. the Bulava. The Yuri Dolgoruky and the world's largest Typhoon-class SSBN, the Dmitry Donskoi, had to be redesigned accordingly. The missile platform, rather than the missile itself, was the main problem. Any Russian, US, French or British SSBN uses special propellant charges, cavitators, when it launches missiles from beneath the waves. These cavitators precede the missile, pushing water aside, thereby enabling the missile to move freely. It is extremely difficult to identify the appropriate clearance between two physical bodies flying out of the water to ensure that the flames of a powder or another charge do not affect the warhead of another. The point is that several nuclear warheads share one multiple independent re-entry vehicle (MIRV). At the same time, the speeds of these two bodies must be synchronised to the highest degree of accuracy to ensure the clearance is not too great. Moreover, the cavitator must fly aside on the surface and let the missile continue to its target. The difficulties did not only lie in the technical and technological aspects. The project also failed to receive regular budget allocations at the planned levels. This naturally affected the commissioning of the new strategic systems and the smooth running of the missile-production chain. Nonetheless, the new-generation SLBM was developed in record time, despite the problems besetting the Moscow Heat Engineering Institute and the country's military-industrial sector. Financing began in late 1999.